Eighty-eight published books read in 2010. Standouts include: Interpreter of Maladies by Jhumpa Lahiri (she did win the Pulitzer for this one, after all), The Journey Prize Stories 21 (juried by Camilla Gibb, Lee Henderson, and Rebecca Rosenblum), and Man Descending by Guy Vanderhaeghe. While there were several novels and plays I really enjoyed this year, short fiction is what affected me the most. These three collections had many stories that reached down my throat to give a good hard tug on my heart strings. Awesome stuff. At the end of November, I was at UBC for the second part of their Creative Writing Symposia, where we discussed pedagogical approaches with the writers TAing creative writing classes as well as leading New Shoots groups with the Vancouver School Board. I've had a lot of fun with these writers (we met at the end of October, too), and I think we've been sharing some cool stuff about learner-centred teaching to both help their students and to make their own teaching just a little bit easier. One thing we did last time which I really got a lot out of was sharing the best writing advice we've ever received with each other. Some of the advice I've heard before, some I hadn't, and I'll share it all with you now as best as I can remember. Simon Fraser University Continuing Studies' Writing and Publishing Program has picked up two of my courses for next spring (one in creative writing, the other in publishing). The creative writing class, Dialogue is Not Conversation, will be offered on Saturday, March 26 from 10:00 a.m. to 4:00 p.m., at SFU Harbour Centre. Simon Fraser University Continuing Studies' Writing and Publishing Program has picked up two of my courses for next spring (one in creative writing, the other in publishing). The publishing class, Websites for Writers, will be offered on Saturday, April 16 from 10:00 a.m. to 4:00 p.m., at SFU Harbour Centre. Tonight I had the pleasure of announcing the winners of 1st Book Competition, put on by Simon Fraser University's The Writer's Studio and Anvil Press at the Vancover International Writers Festival. Myrl Coulter (Birthmother) was named the winner in the creative nonfiction genre category, Jackie Bateman (Nondescript Rambunctious) in fiction, and Rachel Thompson (Galaxy) won the poetry category. As coordinator of SFU's 1st Book Competition, I get the pleasure of announcing the winners at the Vancouver International Writers Festival this Sunday. Until then, here's the short list, as determined by our judges Mark Anthony Jarman, Karen Connelly, and Gregory Scofield. Of the 200 manuscripts we received, the titles below were among the highest rated by our reviewers, and our judges have indicated their decision was a difficult one. The 1st Book Competition, a national literary competition sponsored by the Writer's Studio at Simon Fraser University in celebration of its tenth anniversary (which I happen to be coordinating), has selected our long list of manuscripts from over 200 entries. On Sunday, September 26, I'll be joining SFU's Writer's Studio Alumni Clarissa P. Green, Sandra Pettman, and Renée Sarojini Saklikar in offering free, 15-minute consults on 2-3 pages of writers' work (as well as answer writing questions) at this year's The Word on the Street National Book and Magazine Festival. My friend, Betsy Warland, will be launching her latest book, Breathing the Page: Reading the Act of Writing on Sunday, September 12 at Rhizome Café in Vancouver (that's at 317 East Broadway @ Kingsway). Several of Betsy's former students (whose writing is featured in her book) will join her for three performance readings at 6:00, 6:40, and 7:15 p.m. Why not come along (I'll be there) and join Betsy for what's sure to be a very lively event? I hear there's going to be snacks, too. Back in the late 1990s, my wife and I moved from Canada to New Zealand--we'd fallen in love with the country on our honeymoon (when we backpacked through the South Pacific) and wanted to return. We found work, made arrangements, said our good-byes, and packed our bags. We brought the kids, we brought our clothes, we even brought our photo albums and other assorted family treasures. But some things we couldn't take with us--we'd only reserved two cubic metres of shipping space, so everything we did take had to pass some very rigorous do-I-really-need-this crap-and-will-I-use-it-again tests (the kids got seats with us, so they passed automatically). Since then, I've realized there are a few things I'd wished we'd hung on to, and most of those are books (we only took one bookshelf's worth with us). My one-act play, "Daguerreotype," which debuted at UBC's Brave New Play Rites Festival in 2008, is included in volume 7, number 3 of paperplates magazine (available as a free PDF download on their website). I mentioned in a previous post that the play finally feels complete to me: it's been written, workshopped, edited, rehearsed, produced, had a staged reading, and now, it's been published. Paperplates has also included the stills which we used in the original production (taken by director Lauchlin Johnston), which reminded me how we had people crying in the audience when this first ran: I felt like a ghoul, but their sadness made me happy (the play's supposed to generate tears). Evan Frayne and Joanna Rannelli were awesome in the roles of Edgar and Mrs. Bosanko. Last post I mentioned the strife Rhea Tregebov inadvertently caused when she signed a book to both my wife and me. As a couple we've gotten over the incident, but would you believe I've had another of those experiences? Alison Acheson had a book signing recently for her latest novel, Molly's Cue, and my wife and I and the kids went to see her. Which might be where the problem began. Maybe I should have just gone alone. But I didn't, and we all came and, consequently, did Alison pick only one of us to sign the book to? No, she didn't. Did she sign it to my wife and I? No, something worse. Alison signed the book to my whole family. Now, instead of a two-way argument about who gets to read the book first, there are now four voices in the mix. However, like last time, Alison did weigh in with an opinion of who should be the first reader, and for that I whole-heartedly forgive her. She picked me. In fact, it's how she signed the book--to the whole family, yes--but she specified (in ink with a smiley face, no less) that I get to be first. Yeah, I know, it's a little and petty thing, but sometimes it's nice to be the first one to read a book. I saw Rhea Tregebov last night at the Vancouver Public Library -- she was reading from her novel The Knife Sharpener's Bell and, as usual, she was fabulous. Not only did she read some gripping passages from her novel, she also explained the story behind her writing the book--why the story was important to her, how she took a real life event from her family's past and then pondered a big what if to create something that almost happened (but very luckily didn't). However, in being the super-kind and generous person that she is, Rhea ended up creating some strife between my wife and I last night: in our copy of the book, she dedicated it to both of us (something no one has done before). So while both my wife and I think it's cool, we're now arguing about who gets to read the book first--both of us with seemingly valid arguments over who has the greater right (my name appears first, but Alison Acheson--this other writer I know and respect an awful lot--stepped in on my wife's side). Not sure who's going to win the argument--I think we're both equally looking forward to reading Rhea's book. At the beginning of the year, I started blogging about a recent trip to Mexico. I still have some more photos I'd like to post, so I'll kick myself in gear and get sharing again. One of the coolest sites we went to was the city of Cobá. Unlike Chichen Itza, Cobá was relatively unknown until recently and hasn't seen much archaeological or restoration work. Aside from the sheer immensity of the site, the smaller crowds, the ball courts, and the lack of curio sellers within the gates, the highlight of Cobá is the Nohoch Mul pyramid--the tallest structure in the northern Yucatan (it's 42m high). Got this cool piece of paper yesterday from the University of British Columbia--it says the Faculty of Graduate Studies has conferred the degree of Master of Fine Arts on me (in this neat, old-fashioned font no less). Just thought I'd mention this as I've been working toward this degree for a few years, and now that I'm done, I'm really rather stoked. My wife took the day off work, my kids skipped school, and it was great to see their faces in the audience throughout the ceremony (if it wasn't for them and their patience, I'd never have been able to do this). 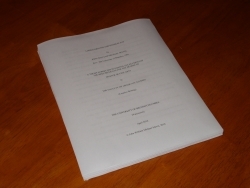 Yup, that's a photo of my finished thesis just before I handed it in. The Faculty of Graduate Studies accepted it a few hours later, so it looks like I'll be graduating from UBC next month with an MFA in Creative Writing. Yay! I found a two-part article the other day on The Guardian's website called Ten rules for writing fiction. Well, it's not really an article, it's more of a two-part compilation of writing tips from famous writers (including Elmore Leonard, Margaret Atwood, Roddy Doyle, Richard Ford, Joyce Carol Oates, Annie Proulx, and Ian Rankin, among others). I've read the rules--some of which I agree with, some I don't, and some I found hilarious (see Will Self's take on corporate Christmas parties). In any case, the collection got me thinking--if I had to generate a similar list, what would my ten rules for writing fiction be? The way I see it, the odds of me living in an Olympic host city again probably aren't too high, so I wanted to get over town and be a part of the celebrations. Yesterday, my son and I gave the lines another chance, and I'm glad we did. Except for a few disappointments (the line for Russia House was too long and the Ontario Pavilion ran out of pins), we had a pretty good day. So, we've got this little sporting event going on over town--I'll stop being annoyingly coy--it's the Olympics and all-in-all, it's pretty cool. Sure there have been some glitches and problems (How can there not be when this many people gather together in one place at one time? ), but still, living in an Olympic host city where you can go out and take part in all the fun is, as I've said, pretty cool. Another break from writing today--this time not so quick. I went over town to check out the free pavilions and to find out where the flame I saw the other day ended up. On Granville Street, I found heaps of art installations, and, after a little hike down to Canada Place, I found the Olympic cauldron with the flame burning brightly. For having so many people in the city, it didn't feel that crowded. Everyone seemed well-behaved, happy, and were doing that most Canadian of public formations--the line up. I took a quick break from writing today--there were a few people gathered close to where I live and I just had to see what was going on. Lots of people, lots of noise (all of it happy), and the rain stayed away until after the flame moved on. I just had a rather interesting weekend--Maureen Medved from UBC got in touch with me last week and asked if I'd give a guest lecture on writing for video games to her Introduction to Writing for New Media class today. Specifically, she wanted me to talk about branching narratives and how to implement them. Of course I said yes--I like Maureen--but, for a couple of reasons I knew I'd end up doing more than just a quick chat about game story theory. While out for a walk in Mexico, my family and I stumbled across a group of Mayan ruins we hadn't known existed--the ancient coastal community of Xaman-Há. We were going from our hotel in Playacar to the city of Playa del Carmen, looking at these rather large and expensive houses and anticipating a frenzy of souvenir shopping when we came across a stone sign proclaiming Ruinas Arqueológicas. Of course, we took the opportunity to investigate, running from the sidewalk into the forest to see what the abandoned buildings were all about (cue the Indiana Jones theme music). About a month ago, I found myself in Mexico's Yucatán Peninsula doing a bit of research for a story I'm writing. And while I was there, I knew I had to make time to visit the ruined Mayan city of Chichen Itza again. I was first there in the late seventies as a child, and I thought it would be cool to see the site again from an adult perspective. Anyone who really knows me understands I've got an over-developed sense of completion. I collect sets of things. I clean my plate. I play all options in computer games. I watch the credits at the end of movies. I read introductions and author's notes. I hate to give up. On anything. I'd rather lose and play things out to the bitter end than tip over my king. However, I don't think I'm ruled by this compulsion--at times, I do walk away and not finish what I've started. Disappointingly, I've found myself at one of those times again. Doesn't Anybody Write in Books Anymore? So, I finished Voaden's Four Good Plays to Read and Act, and I've got to say I'm a little disappointed. Apparently, my mother was a good student who didn't really scribble heaps of non-related crap in her books. Everything she's written seems to be copied from the teacher's comments. Okay, I know she was a good student (she ended up getting accelerated and did four grades in two years), but her lack of irreverence and frivolity was a little frustrating. I'd really hoped to get an insight into a younger her and it just never happened. Although, to give her credit, the book didn't really seem to be the kind that encouraged defacing--or maybe it was just the time she was in high school (the 1940s). In fact, Voaden, in his introduction, apologizes for including plays with "oaths" in them (he means the words "Hell" and "damn"). If society at the time publically avoided a harsher reality, I guess I shouldn't be too surprised my mother didn't rebel and write juicy stuff in the book. Yeah, just when I'm all set to read Voaden's collection and uncover the secrets my mother left behind over sixty years ago, I find this little gem of a book called Almost an Evening by Ethan Coen. It's a collection of three short plays Coen (one half of the screenwriting duo the Coen brothers--check 'em out, they're kind of famous) staged off-Broadway in 2008. The reason this really peeked my interest is because I've got a friend who's been after me to stage three of my short plays together and I've been a little resistant to the idea. I'm not sure people would really want to sit through three shorts in an evening as opposed to a full-length piece. She's insistent it's a good idea, and maybe, after I check out Coen's work, I might think so too. Anyway, we'll see. To the left is a cover scan of the book I'm reading now. It looks bland, a little boring, perhaps. Definitely, way too vanilla. You can't even get a good idea of what's inside. Anyway, before I start deconstructing clichés about judging books and their covers, let me tell you I picked this up a while ago from my dad's library and I'm really glad I did. The book is Four Good Plays to Read and Act, edited by Herman Voaden (it's a book of plays for high school students published in the 1940s). Inside are four plays: My Heart's in the Highlands by William Saroyan, Cavalcade by Noel Coward, Pride and Prejudice adapted by Helen Jerome, and The Fall of the City by Archibald MacLeish, which is pretty good stuff. However, there's more. The coolest thing about this particular book (besides that it's over fifty years old and in really good shape) is that it used to belong to my mother. Back when she was in grade eleven. Before she became a Mavin. Actually, before she even met my dad and obviously way before I was ever dreaded thought of. All the way through the pages are her handwritten notes--scribbles in margins, crossed-out phrases, comments, interjections--the usual things high school students write in their books. And that's what's really cool--having a window into my teenage mother's mind. I can't wait to see what she had to say.